For shipping prices and options, add to cart. Note some products have free shipping. Conductors should be sized to maintain a voltage drop of less than 3% under load. Take Off The Cover And Have A Look! 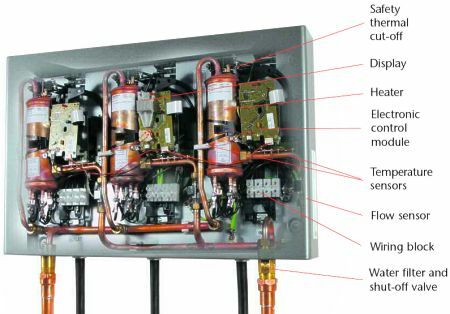 As an International leader in the tankless electric water heating industry, STIEBEL ELTRON is proud to have pioneered this technology. The company's engineering and manufacturing tradition of excellence means that you can depend on its performance for many years to come. 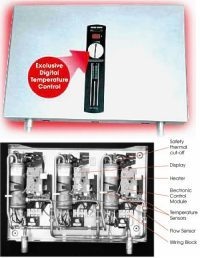 The DHC-E-20 have temperature and flow sensors which feed readings into the unit's proprietary microprocessor control. Heating elements are engaged in stages, achieving the temperature you desire. The unit continually monitors the water temperature they produce. *Safe, reliable hot water for your whole house with a saving on electricity at the same time. What could be better? The Model DHC-E 20 has a single phase, all households in the US are single phase. Voltage is 208/commercial and 240/residential. The wattage is measured in kilowatt hours. Amperage is the incoming service to your home or business that you will need to operate this unit. This is the size of breaker that is needed. Recommended wire size is: (AWG Copper) This means American Wire Gage for Copper wire. It is how big the wire measures around. The smaller the number, the bigger the wire. If you set the flow rate to be 2.25 gallons per minute, the temperature of the hot water coming out of the tap will be 58 degrees higher (residential) than the ambient temperature coming into your house. So if the temperature of the water coming into your home is 50 degrees, then the hot water coming from your tap will be 108 degrees. Minimum water flow to activate the unit to make hot water. The dimensions on these units are considerably smaller than the conventional tank hot water heaters. Weight is the weight of the unit as it is empty. Maximum operating pressure is the amount of pressure the unit will work at. (PSI - Pounds per square inch). Homes in the city run on 80 psi and in the rural area homes run on 40-60 psi. Testing to pressure prevents the unit from bursting, causing accidents, burns, etc. Saving time during installation is a large factor. No one likes making all those trips to the hardware store. Make sure to check out this page before completing your order. (Adobe Acrobat� Required) Don't have Acrobat Reader? The voltage, amperage, and circuit breaker specifications must be met for this heater to function. Please make sure all requirements are met before purchasing this heater. If you have any questions about these requirements, please call 406-889-5288.